Although the primary duty of corporate legal teams has always been to protect the organization, today many are taking on another role and are running the legal department more and more like a standard business unit. What this means in practice is leading the charge in implementing initiatives aimed at reducing cost while mitigating risk. Often this is accomplished through implementing new technologies that allow teams to bring more of the work such as electronic discovery processes in-house. 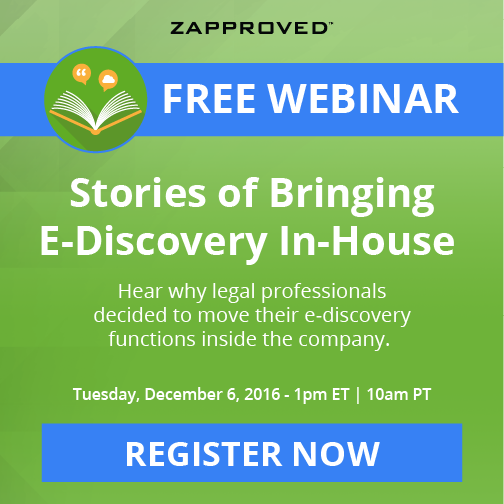 Learn from leading in-house legal professionals why and how they decided to move much of their electronic discovery functions inside the company, including preservation, collection, and processing. More than 80 percent of in-house legal teams are making the move, so learn what went well and what didn’t. For those who are considering a similar move, this webinar will share real-world experience from peers who have taken the leap so you can learn from their successes as well as avoid any pitfalls they experienced. Wendy Riggs, Senior Manager, eDiscovery and Litigation Operations, Twitter, Inc.
Jennifer Bantelman, Sr. Director of Product Management, Zapproved, Inc.